“Sorcery! The Shamuntanti Hills” is the first book of the choose-your-own-adventure series, written by Steve Jackson and published in 1983 by Penguin Books. And it was converted earlier this year for mobile devices by inkle. 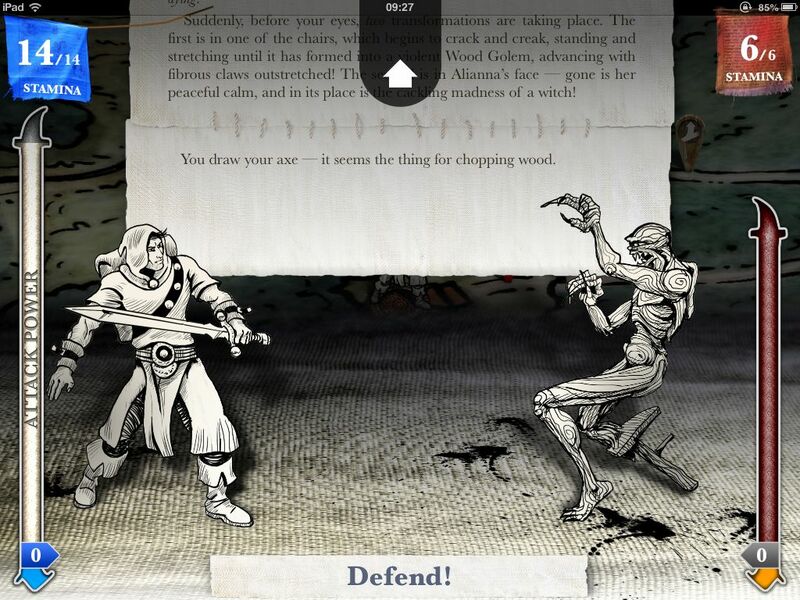 The books can be approached as stand-alone titles or as a series; the player can even transfer his/her characters with all of their equipment and spells between books. I must say that as much as this is review of a choose-your-own-adventure book, I’ll talk more about the mechanics in it rather than the story. So, here it comes. The story is set in the fantasy world of Titan, on the continent known as The Old World where fantasy monsters, magic and traps await the player. The world is detailed and atmospheric enough to pull you in itself. You will meet exotic tribes and giants, crafty witches, hostile elves and many more. The whole area of the Shamuntani Hills is presented by a detailed map on which the player/reader makes his/her choices where to go. The character is presented by a figure that moves on the map. After you decide where to go the map is replaced by text, which, I would advise you, to read carefully as it will help you a lot with your decisions. As I said I will not say much about the story because I don’t want to spoil anything for you, but I found it interesting and intense enough to make me want to read the next one immediately after I finished this. You’re the hero who embarks on a quest to retrieve the stolen Crown of Kings which gives its wearer the mystical powers of leadership. Before the start of your adventure you will have to make one imortant choice – to be a warrior or to be a sorcerer. The main difference is that the first has an access to the 48 spells but is a weaker fighter. Mentioning the spells let me tell you more about the few interesting mechanics of the game. Spell casting is done in interesting way – every time when you have the opportunity to use sorcery, you’re presented with a list of three-letter words among which you must choose one. Not all the words in the list are spells so careful choice is a must. Both sorcerer and warrior can use the help of their patron goddess Libra which can perform wide range of services for them. The text is shown in small snippets with all available choices at the bottom. After you read the portion of text you take a decision and snippet based on that decision is stitched to the first one. This creates the nice feeling that you are indeed the one who is developing the story. You can talk out most situations but sometimes fight will be inevitable. When the battle starts you will see a screen with your char and the enemies standing against each other with sliders on each side and the text which leaded to that situation in the background. The fight system is simple at glance, but actually is really deep. In the book you use stamina for all kind of actions including fights. Once your stamina reaches zero you lose the fight. The battle goes in turns, on every turn you choose to attack or defend and your opponent does the same. If you choose to attack you also are choosing the power of your attack by sliding your character. If your attack is more powerful than the one of your enemy he loses stamina and vise-verse. With every attack your power drops and you will be able to do less and less powerful attacks unless you decide to defend. Really nice touch is that after each exchange of blows a new snippet of text is stitched to the one in the background, actively developing the story even during the fight. 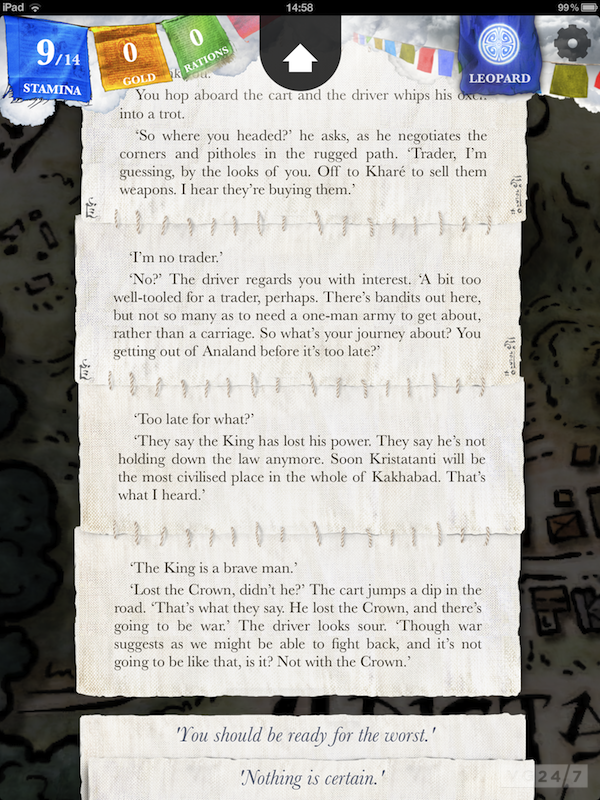 And again my advice is to read this text as it will sometimes contain hints for the next move of the enemy. In conclusion, I can say that “Sorcery!” is a great choose-your-own-adventure book mixed with RPG, containing everything that the fans of this genre love and then some more. Definitely, look into it and you will thank me later. Публикувано от Sharki в 10:50 ч.